Specialization Course, CSIC´s training plan course, Workshops & Seminars, etc. Instrumental Sciencies & research techniques. Current edition, from 7nd October to 7th November 2019. Classroom-based course, in which the student will learn the basic concepts of GIS and remote sensing, and their main applications to scientific, technical and business projects. It will enable the student to obtain the certificate from Spanish National Research Council (CSIC), and college credits from Complutense University of Madrid (UCM) and Polytechnic University of Madrid (UPM). Practical exercises will be completed with ArcGIS, QGIS and ERDAS Imagine. Introductory Course to Geographic Information Systems with ArcGIS. Upcoming introductory course to GIS will be held during the week of 25-29 March 2019. Advanced Course to Geographic Information Systems with ArcGIS. 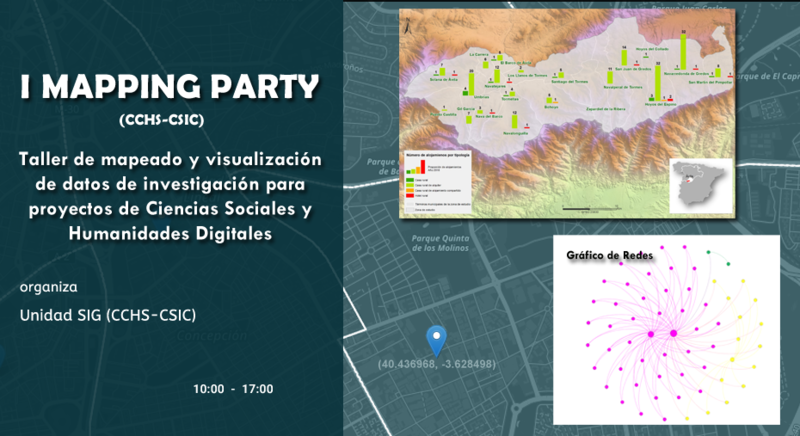 Mapping Party is a workshop for mapping and visualization of research data for projects of Social Sciences and Digital Humanities.